Only a statistician loves statistics and I am no statistician. However, it’s interesting to try to track the growth in Office 365 numbers based on the snippets of information released by Microsoft in their financial results and elsewhere. Last week Microsoft talked up their FY16 Q3 (to the end of March 2016) results and revealed that Office 365 had achieved 63% growth in constant currency over the previous year. That’s a pretty good result that demonstrates continuing interest by customers in moving from on-premises Office services to their cloud equivalents. During his briefing following the announcement of Microsoft’s results, CEO Satya Nadella said that Office 365 now has over 70 million active users (folks who actually log on and do some work). The number of licenses sold, provisioned accounts, and mailboxes is likely much higher. Licenses include seats sold but not yet used, provisioned accounts include those awaiting users to switchover to the cloud, and mailboxes include shared mailboxes, inactive mailboxes, group mailboxes, and all the other form of mailboxes supported by Exchange. The figures reported in the survey for email systems don’t add up to 100%. According to Michael Osterman, this is because some organizations use multiple email systems. For example, a hybrid deployment might use both Exchange 2013 and Exchange Online. In any case, we end up with a total of 102% in 2016 and 106% in 2018. I expect the cross-over to be larger because most of the large organizations that I know use hybrid deployments and I believe that substantial growth will occur in this space over the next few years as companies make their mind up about their future email platform. Hybrid capability is, of course, the jewel in Microsoft’s email offerings because no other vendor can accommodate the mix of on-premises and cloud in the way that Exchange can, especially after the recent investments to make the Hybrid Connectivity Wizard more robust and easy to use. This information is interesting but what does it mean in terms of the overall email market? Well, as it happens, Osterman Research released an interesting “infographic” last week based on their research that provides a snapshot of where that data indicates the email market to be now and where it will be in 2018. In any case, by their very nature, surveys like this are restricted in terms of accuracy to the scope and size of the source data, which is always limited when compared to the overall global market. None of the email vendors publish the number of licensed seats that they have sold so a certain amount of guesswork is needed to make sense of what’s happening. However, the survey results are broadly in line with what Microsoft’s financial results have been telling the market for the last four years. 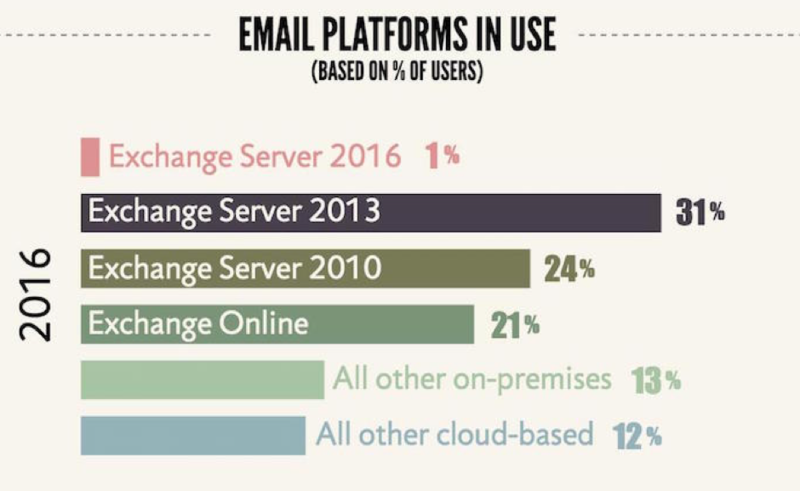 If we take the data published by Radicati and others and assume that the overall size of the Exchange installed base is circa 340 million, then the 77% market share occupied by various forms of Exchange in the Osterman survey indicates that the overall commercial email market is about 442 million (the consumer email market is far larger). Of this, Osterman reports that 21% now use Exchange Online, or approximately 92.7 million seats. By comparison, at the Ignite 2015 conference, a Microsoft speaker said that 35% of all Exchange users used Office 365. I consider this figure to be too high and is not backed by what I hear from customers. Returning to Microsoft’s report that Office 365 now has 70 million active users, it’s reasonable to assume that most of these people use Exchange Online as few Office 365 tenants buy the service simply to use SharePoint Online, Skype for Business, or even Yammer. 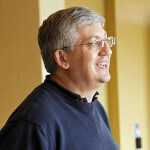 The difference between Osterman’s 92.7 million number and Microsoft’s 70 million is likely accounted for by educational and other low-cost tenants, test tenants, and free usage extended to Microsoft “friends and family” (full disclosure: as an MVP, Microsoft makes a free 25-user tenant available to me). Good as the growth in Office 365 revenue and user numbers is, I wonder whether some softening has happened in the last few quarters. Don’t get me wrong. 63% revenue growth in constant currency is still something that any company would like to see for a new platform and Microsoft revenue from commercial cloud products has now surpassed $10 billion, a $600 million increase over the figure previously shared. However, the data we are now seeing is a reduction on the 100%-plus growth reported previously, which makes me think that perhaps Office 365 has consumed a lot of the “easy” targets in small-to-medium businesses around the world. Certainly, a large percentage of the 1.2 million Office 365 tenants are not global giants, and it’s those large enterprises that take longest to move computing platforms, no matter how attractive the new platform is. Arguing against myself, the 10 million increase in the number of active Office 365 users is an impressive gain over the last five months. Looking to the future, Osterman’s survey predicts that Exchange Online will have 35% of the market in 2018, or around 155 million seats. Satya Nadella’s goal is to achieve a $20 billion revenue run rate for commercial cloud products by the middle of 2018. Microsoft is half-way to that target but there’s plenty of heavy lifting to be done by the Microsoft sales force in the next nine quarters to achieve that goal. In the same period, another 60-odd million mailboxes seem likely to move to Exchange Online. That seems like a lot, but when you break it down, it’s only about 182,000 mailboxes a day. That sounds possible, doesn’t it?